Sophia Cradle Upgrades SophiaCompress(Java), Deleting Unnecessary Interface etc. KYOTO — February 28, 2006 — Sophia Cradle Incorporated (Headquarter: Kyoto; CEO: Kazunori Sugiyama), an innovative developer of mobile phone software, today announced to release SophiaCompress(Java) [*1] 4.0, an upgraded version of its leading-edge compression technology for mobile Java applications, on March 6. Main features of the new version are: deletion of unused classes, methods and interfaces, a compression wizard, and a support for Willcom Java. 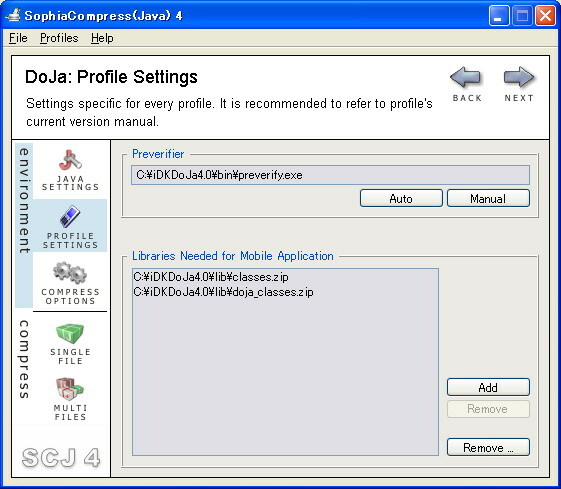 Sophia Cradle releases an upgraded compression tool for mobile Java applications SophiaCompress(Java) 4.0 on March 6. Compression rate is enhanced by deletion of unused classes, methods and interfaces. Other new features include a compression wizard and a support for Willcom Java. Today, mobile phone Java applications, which are often equipped with database, financial transactions, camera, FeliCa and a Quick Response code functions, are one of the most important business solutions for stock and banking companies. 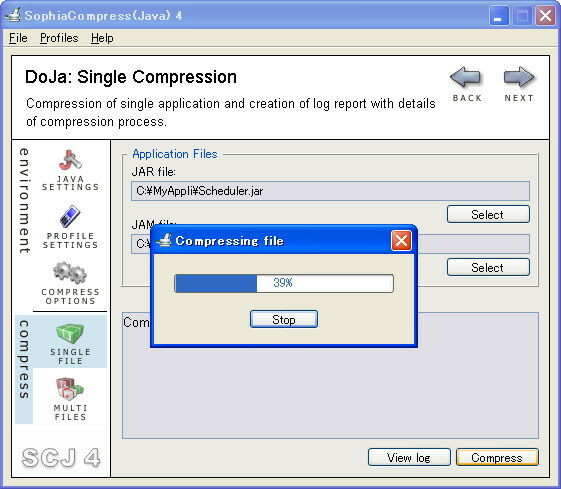 Since these applications must be reliable and work fast, programmers are required to use a proven and tested compression tool that enables a very high compression rate like SophiaCompress(Java). Free Trial is available at the Sophia Cradle website from March 6. A full-featured product is JPY 300,000 per license (without tax). Software released by Sophia Cradle in July 2003, for compressing mobile phone Java applications, supporting all Java specifications of major network operators around the world. SophiaCompress(Java) compresses a Java application in compiled JAR format to be run on a handset. It is adopted by major content providers, game makers and system integrators, making it the de facto standard of the compression tool industry for mobile phone Java applications.